Discover all the prestigious guests who will be present at this new edition of Crespi Cup, not only bonsai professionals, but also writers, musicians and designers. He has been teaching bonsai art in Italy at the Crespi Bonsai University since its establishment in 1992 and he takes care of the development of the Crespi Bonsai Museum masterpieces. He regularly gives lectures and courses in various European and non-European countries, where he also takes care of important bonsai collections. His sensible approach to bonsai trees is the result of the long experience gained in different geographic conditions and of his great respect for nature. Sadamitsu Kataoka, born in 1943, is a direct descendant of the man who contributed to raising the status of Tokoname ceramics in 1920: Akiji Kataoka, producer of the homonymous manufacturing of porcelain for bonsai pots, collector and connoisseur of ancient Chinese pots, founder of one of the most famous furnaces in the world, namely Yamaaki. Sadamitsu Kataoka, after graduating at the Tokoname high school – ceramics section in 1961, joined the family business and continued to study ceramics under the guidance of his father. Since 1985 the ceramics of Sadamitsu Kataoka are signed with the name of Koshousen. He also invented the style of the pots made of “wood grain”, that is to say with an irregular surface with the appearance of the wood grain. 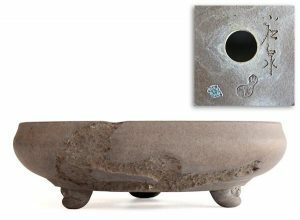 The quality and value achieved in the realization of the pots by this author are often superior to those of his father, so much so that, for his extraordinary activity as a ceramist, he received from the Japanese government the honor “Order of the sacred treasure silver rays “. He refined its ability to observe with the use of photography, capturing in the frame of view the artistic aspect of the subject. 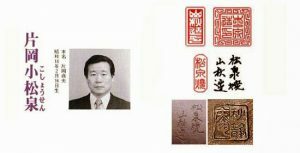 Over time, the development of visual skills has fostered interest in martial arts, disciplines he has devoted for many years, approaching definitively the Oriental culture. He started to take interest in bonsai in 1988, experimenting with nursery’s materials at first and then following courses, seminaries and workshops with Kimura and Terakawa. He is I.B.S’ teacher since ’98; he regularly hold demonstrations and bonsai courses in many Italian cities. In 2009 he became a member of the Crespi Bonsai staff. Born in Kobe (Japan), after commercial studies, she works for the Shiina Company, dealing with cloth decoration with the “yuzen of Kyoto” technique, which she refined under the guidance of master Shimizu Mitumi. Selected by the Japanese Handicraft Association of the New Artist in the `88, she attains a long series of awards. In 2002 she moved to Italy to present the old yuzen method through her art. She is a yuzen technique teacher at the Prato Cloth Museum. She has performed kimono exhibitions in several Italian places. She teaches Japanese at the University of Studies Bicocca of Milan and Japanese language and culture at the High School of Linguistic Mediator of Varese. She collaborates with some foundations and cultural centers. She is president of the Italia-Asian Center and of Aistugia. Curator and writer, she published for Zanichelli: Dictionary Italian-Japanese, Grammar practice of Japanese; Japanese writing. She is the official translator of Crespi Bonsai. Born in Kochi (Japan) in ’57, she graduated in music at the “Aichi Prefectual University of Fine Arts”. She has been living in Italy since 1984 and currently she is active in the culinary field and expert in Japanese handicraft confectionery. Lover of origami, he learned the ancient Japanese technique of folding the paper by attending courses and workshops held by various experts.